Thanks so much Dan! Really finding this website invaluable in my research in to virtual tours. I've got some trepidation about jumping head first in to the Matterport ecosystem and I'm curious about Cupix. The only limitation I've noticed is camera quality, none of the 360 cameras have the same level of quality as the Matterport one. The closes is the Insta360 Pro and thats getting close to the same price as the Matterport camera. Can you recommend a camera that is as good as matterport? Thank you for you kind note. How will you be using 3D Tours? I tried a Theta V and promptly sent it back. Being a real estate photographer by trade, I found the image quality unacceptable. Maybe good for a party or vacations, but not for serious work. Today I accepted delivery of a Nodal Ninja R1 adjustable tilt pano head and lens ring package, which I’ll be using with my Nikon D750 and Samyang 12mm f/2.8 lens. Set the tilt to 5 degrees up and roll the camera 33 degrees. Take 6 bracketed shots around. I expect image quality to not only blow away most 360 cameras, but the Matterport as well. For construction documentation, it's likely that the Ricoh Theta V will be a great choice. While your imagine quality will be excellent, I find the workflow too slow except for high-end projects. 360º 1-click cameras are getting better and the price is coming down. The future of our space gets more exciting every day. The tools we use today will likely be different in a couple of years from now. The good news for you, CUPIX works great with your workflow too. @CFster Thanks for that info. That was my understanding too, that DSLR panos are the number one choice for premium quality images. But as @DanSmigrod mentioned, the workflow seems so cumbersome especially for someone like myself where virtual tours only makes up a portion of my business. Workflow is important too. Out of interest @CFster would you be uploading your DSLR pano's using the Cupix platform? It looks like the Insta360 pro is the best option for the 1-click cameras. @DanSmigrod perhaps you could get in touch with the guys at Cupix and get them to try do a shoot using the Insta360 Pro using the version 2.0 firmware that introduced the 12K photos. I'd be interested to see how much that improves a virtual tour experience. Plus, I would like to see how CUPIX plus the Insta360 Pro 2 (announced, but not available yet) does too. @flexcopmusic I tried Cupix but find it too expensive for what I do. I’ve been using iStaging which is just 360 panos linked together with tags. So I only really need to shoot one 360 per room. This was shot with my Theta V.
@CFster - Thanks! thats good to know. Was that captured with the a DSLR setup? @flexcopmusic no that was with the Rico Theta camera. I wasn’t happy with the image quality. Like I said I just got the R1 and am flipping lost. One source says I have to roll the camera 33 degrees and take 6 shots diagonally (no idea how to even process THOSE shots), another says shoot in portrait mode and take four shots, but that’s obviously not enough shots around. I thought I would chime in on this discussion and cost of Cupix. Full disclosure, I am part of the Cupix team! You need to make measurements a standard feature. Six shots in portrait orientation with the camera rolled 33 degrees and tilted up 5 degrees to get rid of the zenith hole. I’ll worry about patching the nadir later. My initial problem was not having the nodal point set correctly. A couple millimeters off and you get all kinds of stitching errors. But now that everything is set, it’s just a matter of slapping it on the tripod and doing six quick shots per space. Stitching them in PTGui is very quick. I hope to have an opportunity to test it out on an unusual property on Thursday. I’ll post results here. @CFster Looking forward to your results! If you can pull it off it seems like a perfect solution to getting premium quality photos with a reasonably quicker workflow (rather than having to take 2 photos up and down as well, or having to do multi-row panoramas. If I could get away with just taking 6 bracketed shots at each point that could be a great alternative. I'm hoping to get some results soon from Cupix using the 12K photo mode on the Insta360. I'm not a big fan of the Theta V, but I am a huge fan of what systems like Matterport and Cupix provide. I would rather provide a tour with a massive number of angles and an immersive experience than select panos linked with arrows between doorways. Realtors want to impress sellers -- AEC / CRE is all about details and documentation. The Matterport Pro2 is an excellent camera as it provides zooming into the high res imagery. I would imagine that the images would look amazing on the Cupix platform if there were a straightforward way to export them at full quality. What I love about Cupix is that there are so many cool tools for annotation. 3D Shapes can be placed that represent real world measurements -- and this is a POWER TOOL. While I do like the idea of bespoke platforms and simple ways to link scenes together, at the end of the day, I'd rather spend a bit more time on site using a one shot or auto rotating camera to take more shots if the workflow at home is a simple upload with all of the moderation done for me. Have to work on removing the tripod from some shots (but that’s an issue with MP too), and coming up with some kind of batch process for patching the nadirs. You can put the hotspots on the floor too, I just preferred them higher for this one. Here's a single high res pano of a very interesting property I shot as well. How was the process for you using that setup you mentioned? 5 photos at 33 degrees? Was stitching those images a problem at all? Amazing result by the way, I'm going to look in to it! 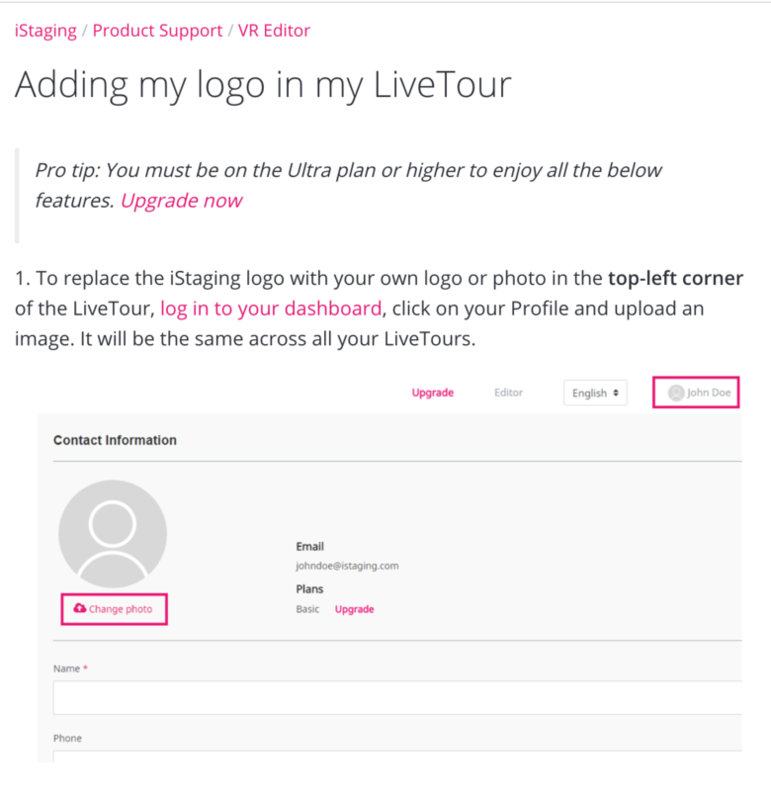 In iStaging, you can globally add your logo - to cover the tripod - if you upgrade to an Ultra account. That is six shots around (rotator set at 60 degree stops), tilted up 5 degrees, and the camera rolled 33 degrees from portrait orientation. With the NN R1, my rail setting is 23. I actually had the rail setting wrong (entrance pupil distance) for the second 360 image I posted. There are some stitching errors in there, fortunately not too noticeable. For the tour though, I think it’s pretty error free. Each shot was a bracket of three, though I probably could have gotten away with just one as it was in the early evening and the light coming through the windows was dim. I would prefer not to do HDR as I don’t like the look. Everything was stitched in PTGui. Once I got the camera settings figured out it stitched every one of 24 panos without a problem. So, if you go this route practice first before you take a paying gig. iStaging aside, of you know of any ways to patch the nadir on a group of images? Like a photoshop action or something? The end game for me is to host these tours myself. Please do start a new discussion about local hosting of 360ºs. That's a great topic. 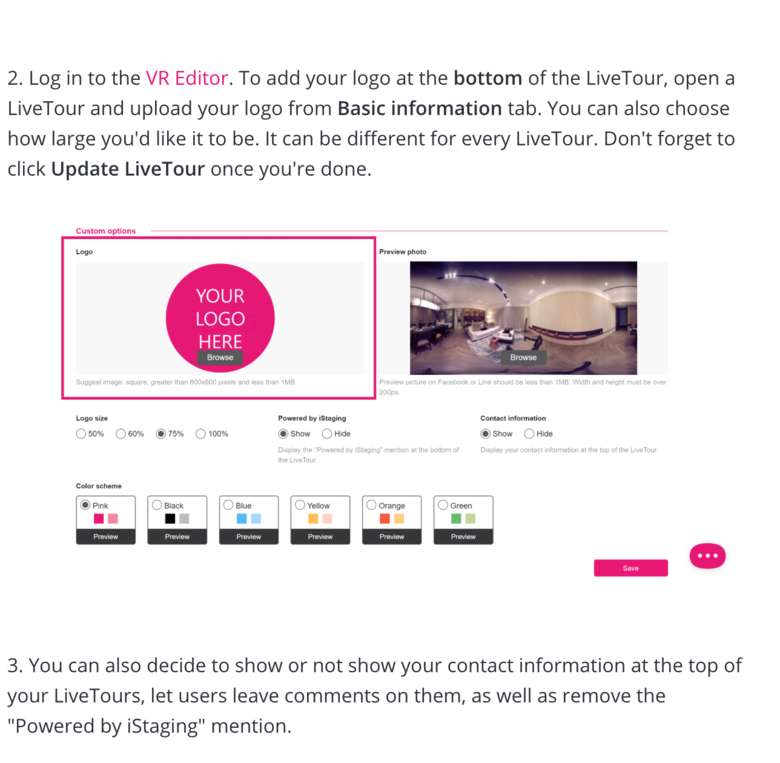 CUPIX lets you globally apply the nadir logo patch to all images within a tour. (You can even set up the nadir patch as a default. With CUPIX, you can also change the nadir logo patch individually. P.S. Since CUPIX has a free tier, do you want to do a side-by-side test with iStaging and CUPIX? I’m not shooting enough panos per room for CUPIX. In their case, an instant 360 camera is the way to go - using a DSLR setup would just take too long to complete a viable tour. Especially for real estate, where I need to just get in and out. If an exceptional property comes my way, I would consider it though. Speed Shooting a DSLR for Cupix I follow the following workflow for speed. I use Canon 80D APS-C sensor camera with a Canon 8-18mm fisheye at 8mm with a Nodal Ninja R20 rotator. This is angled at 7.5degrees upwards and stitches perfectly with 4 RAW shots around. I use my logo for a nadir patch and set CUPIX so down view angle at 45 degrees so that one does not see the nadir patch unless one zooms out totally. It takes 5min 30secs to shoot TEN images this way with a DSLR. Expose for the brightest area and press auto in Lightroom before exporting the image files as 6Mb Jpeg files via Jpeg Mini app to PTGui for stitching. Run through JPeg Mini again with the completed Pano before importing around 8-10Mb images into CUPIX. I use my Ricoh Theta for then connecting images in doorways and passages to reduce my post-production time. @leonvanzweel Great to hear the specifics about your workflow! Do you have examples of your work with that setup? Your website link seems to be broken. I heard that only taking 4 photos with the DSLR doesn't give as good resolution as 6+ photos. I'd love to only have to take 4 photos per spot so if it looks good I might try your setup. Any particular reason to chose the Nodal Ninja r20 over the R1? Six Images gives you more overlap between images. I use six images when there are moving objects (people, cars) in the image so that I can mask the object on the stitch line. I have an NN3 MKIII which I use if I have to tilt up and down and an R20. It does everything I need. I do not have any experience with the R1, but it looks interesting. It looks essentially like an R20 with a tilt function. It looks like a good choice. I shoot 4 Images around (normally bracketed 3 up to 7 brackets depending on the dynamic range)and let CUPIX automatically insert my logo in the nadir. Alternatively, I will shoot a step away handheld shot and stitch it in Viewpoint Correction in PTGUI Pro see Tutorial See his other tutorials as well. Here is a comparison of image quality for Matterport vs Panono using Cupix software. Your thoughts? Of course the Panano IQ blows away MP. Curious though, I’m seeing stitching errors with it. @marktgun Wow thats an amazing comparison! exactly what I was looking for. The results look very comparable. What has your experience been with the Panono, usability and dynamics range? I've read a lot of negative things about the camera but the 16K is pretty enticing. @DanSmigrod - This should be of interest to you as well. (I sold the camera on eBay after about 30 days. Lot's of stitching errors. Perhaps it is better now.